Government and veterinary leaders are trying to make it easier for professionals to keep working when they change states. Veterinary associations, governors, legislators, and federal trade regulators are running a mix of projects to reduce the work people need to do to meet state job licensing requirements. At the same time, legislators in a dozen states have proposed revising or reviewing professional licensing rules, raising concerns in veterinary organizations that veterinary technicians could become targets. Federal Trade Commission officials published a policy paper this fall that encourages state authorities to improve license portability for a wide spectrum of professions. Licensing of many professions protects the public, but state-by-state job licensing requirements burden people who want to sell services or live in another state, the document states. James Penrod, executive director of the American Association of Veterinary State Boards, said association staff are trying to simplify the process of licensing veterinarians and veterinary technicians already recognized in other states. For 20 years, the association has given licensing boards background information on veterinarians and veterinary technicians through its Veterinary Information Verifying Agency database, which contains scores from licensing examinations and other credentials. AAVSB staff now are building on that database with the Veterinary Application for Uniform Licensure Transfer program. The VAULT is intended as a single source for license application information, including primary source documents and discipline history. Penrod provided information that indicates VAULT reduces efforts needed to gather and coordinate information for license review, and the AAVSB guarantees that documents sent to boards are authentic. Veterinary boards from eleven states are using VAULT, and representatives from 14 more have expressed interest, Penrod said. The National Conference of State Legislatures, Council of State Governments, and National Governors Association also are examining state licensing rules in a three-year project backed by $7.5 million from the Department of Labor. The organizations together represent state legislators, governors, judges, and employees. In the project, elected officials and staff representatives from 11 states are studying how state rules vary for 34 jobs, including veterinary technicians. All of the jobs are growing professions that require less than four-year degrees and are regulated in at least 30 states. You could argue that, if it's licensed in 30 or more states, chances are there's a reason for that. It's more the occupations that are licensed in one or two states that people tend to question a little bit more." An NCSL report from January notes that people without four-year degrees have higher unemployment rates. The most recent Bureau of Labor Statistics data indicate that, as of August 2018, unemployment rates for people 25 and older ranged from 3.5 percent among people with associate degrees to 5.7 percent among people with less than a high school diploma. Suzanne Hultin, director of the Employment, Labor & Retirement Program for the National Conference of State Legislatures, said the project of examining state licensing rules helps policymakers research effects of license requirements on people such as military veterans and their spouses, immigrants who have work authorization, and people with criminal histories. 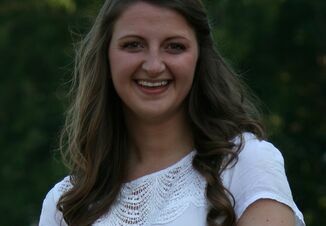 The project is helping policymakers connect with experts and learn from one another, she said. But people have mistaken the focus on the 34 professions for a "hit list" for deregulation, Hultin said. "You could argue that, if it's licensed in 30 or more states, chances are there's a reason for that," Hultin said. "It's more the occupations that are licensed in one or two states that people tend to question a little bit more." The National Conference of State Legislatures plans to publish a final report on the project by December 2019. A 2017 NCSL report states that about 25 percent of people employed in the U.S. have job licenses, up from about 5 percent in the 1950s, and state rules frustrate people who want to work and increase costs. The authors noted a few actions by state leaders. In 2016, Arizona Gov. Doug Ducey signed a law that eliminated licenses for a variety of jobs including citrus fruit packer and yoga instructor, the report states. The same year, the Georgia and Illinois governments directed state agencies to let people with criminal records work in licensed jobs when their convictions are unrelated to the work. Penrod of the AAVSB said that, in 2018, legislators in at least 15 states introduced legislation that would revise professional licensing rules. His organization has tried to help member boards teach legislators why licensing requirements are important in the veterinary profession. Penrod said legislatures seldom remove license requirements, and he thinks it's unlikely to happen to veterinary technicians in those states where licenses are required. But he has heard rhetoric from elected officials who want to reduce licensing requirements. Some jobs targeted in the past decade by governors and legislators include talent agent, hair braider, potato shipper, motor vehicle salesperson, ballroom dance instructor, and animal masseuse, according to bill text, announcements, and a 2012 report from the Institute of Justice. In a Sept. 24 report from the FTC Economic Liberty Task Force, the authors urge policymakers to reduce or eliminate licensing mandates that erect barriers and increase prices without improving quality or protecting public health and safety. "There is little justification for the burdensome, costly, and redundant licensing processes that many states impose on qualified, licensed, out-of-state applicants," the report states. "Such requirements likely inhibit multistate practice and delay or even prevent licensees from working in their occupations upon relocation to a new state." The Department of Health and Human Services is giving professional licensing boards money to develop licensing compacts in the health professions, the report states. For example, 24 states and one U.S. territory are participating in the Interstate Medical Licensure Compact, which expedites physician licensing. 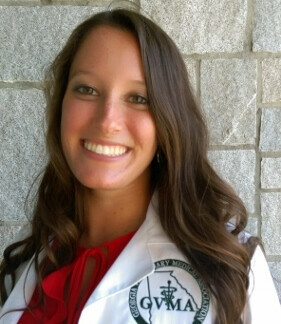 Earlier this year, the AVMA, AAVSB, Association of American Veterinary Medical Colleges, and National Association of Veterinary Technicians in America signed a joint statement that the licensing of veterinarians and veterinary technicians protects the health, safety, and well-being of people and animals and ensures those working in veterinary medicine are competent, up to date on training, and working in clinics that meet standards. "Public protection through licensure is equally essential for fields where public health may be impacted," the organizations said. "Veterinary professionals play a key role in disease prevention, identification and treatment of zoonotic diseases, ensuring the safety of food and feed, dog bite injury prevention, animal control, and ensuring the functional health of working animals, such as service dogs." The statement also argues that, rather than licensing preventing competition and imposing unnecessary costs, some research indicates licensing increases the supply of qualified workers and access to professions. AVMA Deputy CEO Adrian Hochstadt said the organizations wrote the statement when the AAVSB raised concerns that licensing was under attack. Lawmakers have proposed not only removing licensing for some professions but also imposing review cycles for all occupational licenses. Leaders of the groups see veterinary technician licensing as more vulnerable than veterinarian licensing, he said. FTC information notes efforts since 2011 to review job licensing in several states, such as a 2011-12 review in Michigan of which occupations should remain licensed and proposals since 2016 in Delaware and Wisconsin to review which job licenses are in the public interest. In July 2017, House and Senate Republicans introduced bills to give licensing boards immunity from antitrust laws if they develop systems to review their regulations and, when considering adding license requirements, study less-restrictive alternatives. Neither bill has received any votes. Hochstadt said the AVMA is learning from and supporting partners in veterinary medicine. The AVMA is preparing in case legislators challenge license requirements next year. The joint statement notes that NAVTA leaders have been working to standardize veterinary technician credentials. Mary Berg, immediate past president for NAVTA, said license portability is among the concerns her organization is trying to address through the Veterinary Nurse Initiative, which involves standardizing professional credentials and adoption of the title of veterinary nurse. Berg said she and other NAVTA leaders had heard concerns that states could consider removing veterinary technician licensing requirements, and she sees reason for concern. 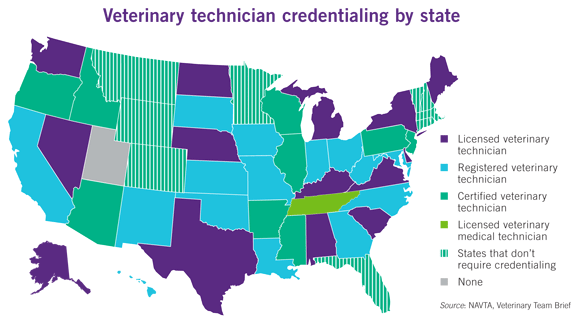 Veterinary technicians need to be licensed or registered in 37 states, according to lists from NAVTA and the NCSL, but there are about a dozen where credentialing isn't mandatory. The AAVSB has distributed a document that describes the health care procedures performed by veterinary technicians with little to no supervision and the ways technicians reduce potential harms to patients, clinics, veterinary professions, and the public. 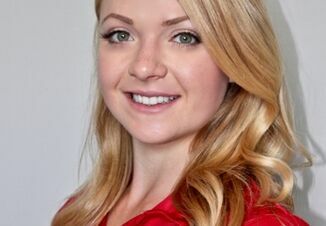 Penrod said legislators could help protect the public by introducing bills where veterinary technicians are not licensed. But he said his organization and its members are educators, and it is up to other parts of the veterinary profession to advocate.